Unfortunately, it does rely heavily on specialty vegan products and dairy product alternatives. Sorry to those of you who don’t have easy access to this stuff. Either thaw the spinach completely in the refrigerator overnight or do what I did… Place the spinach in a microwave safe container and microwave it on high for about 5 minutes or until completely thawed. Place the thawed spinach in a wire sieve and press out as much of the liquid as you can using the back of a spoon. This can also be accomplished by placing the spinach in a clean, flour sack style dishtowel (the kind without fuzzy loops) and twisting it into a tight ball, squeezing out all the liquid that way. However, your dishtowel will be stained green. If you don’t mind that, this technique has worked for me in the past very well. Discard liquid. 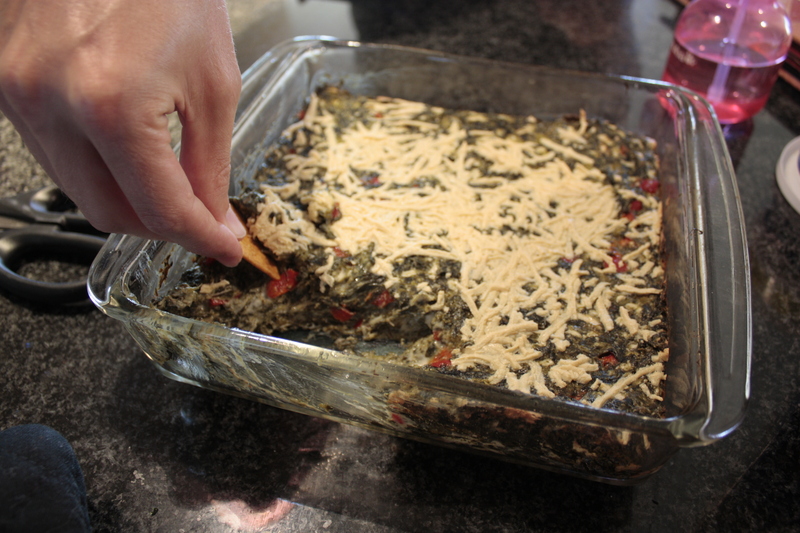 Place the spinach into a large bowl and add green onions, vegan cream cheese, salt and vegan mayonnaise. Mix well. If the mixture seems too thick to you, add another tablespoon or so of vegan mayonnaise to thin it out. Add the bell pepper, 1 cup of Daiya, garlic powder, and oregano. Mix well. Spray an 8 or 9 inch square, glass baking dish or a pie plate with vegetable oil. Spread the mixture into the pan. Sprinkle a little extra Daiya on top. Bake for 35 to 45 minutes or until hot and bubbly. Let cool about 5 to10 minutes and serve with your favorite crackers or crusty bread.